Restarting a restore project I dropped while finishing school. This fan was running wired direct for one speed due to the missing speed switch/coil. Would like to find one and would also be interested to know what R&M fans share the same parts. Thanks! It would help if you’d post a pic of the fan you’re looking for parts for. Do you have a switch that will fit it? That's very similar to the R & M 3854 which was also made for Western Electric. 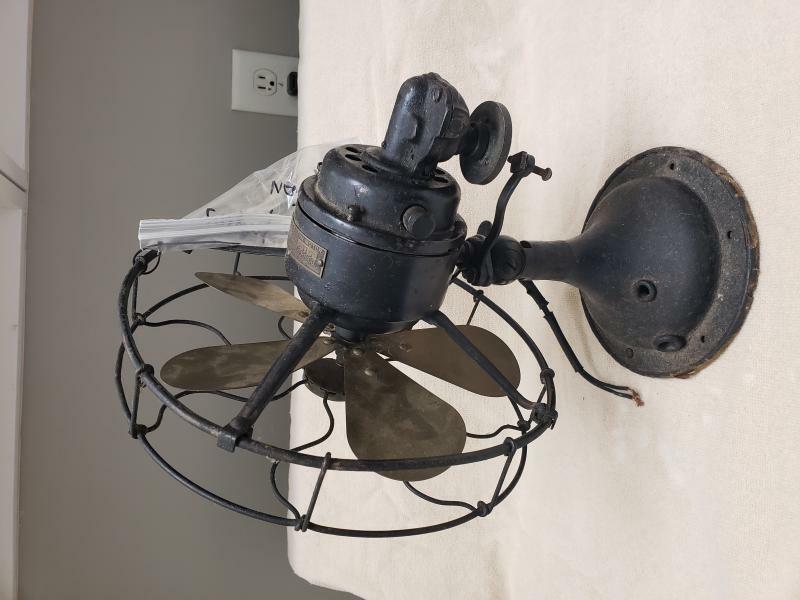 I figure that fan dates to early 1920's because your fan has the old oscillating disk design on the back that was vastly improved in 1926. By the way, the screw and nut holding the oscillator arm to the rotating disk are wrong- contact Darryl Hudson at Hudson Custom Machining for the right brass screw nut combo. I bet that the 3854 speed coil would work on that fan although maybe the AC/DC universal fans (like this one) take a specific speed coil. I would try contacting Chad Baker at http://www.Antiquefanparts.com. He might have the speed coil that you need. (And yes, the blade is definitely on backwards). Here is a 3854 R & M (made for Western Electric) that I restored for a friend. This fan is NOT an AC/DC universal fan like yours. Yours is a special fan. Thanks for the reply David. I will contact Daryl directly. Beautiful fan too! What type of paint works best to get that beautiful shine? Also, is the braided style cord the original style that came with fans from this era, or was is typicallt non-braided cloth covered? His fan is a 10” fan , not a 12” like the 3854. Completely different parts. It’s a fairly common fan, though the 5 blade versions are more desired. Thanks Lane. Do you think that the 3854 speed coil would work with the AC DC universal fan like his? I really doubt it. 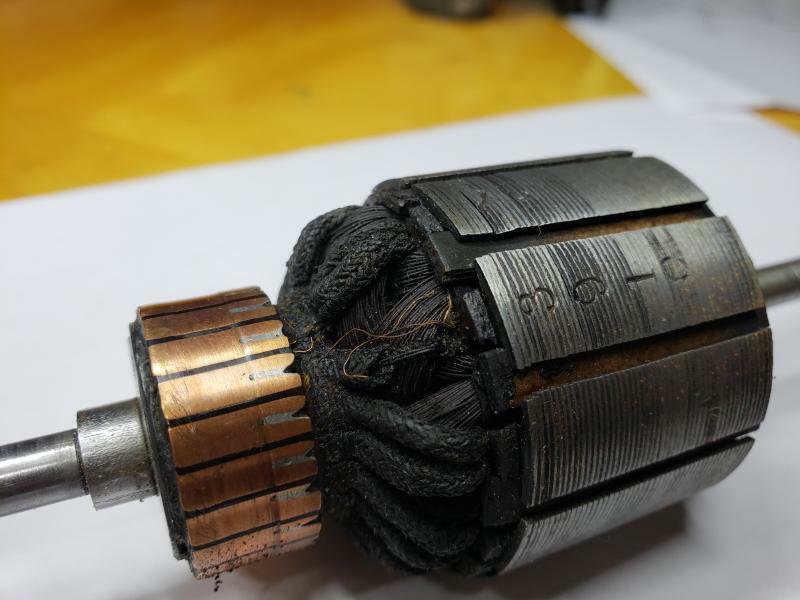 My guess is that his speed coil was a resistive nichrome winding. The 3854 has a 3 wire reactive speed coil . 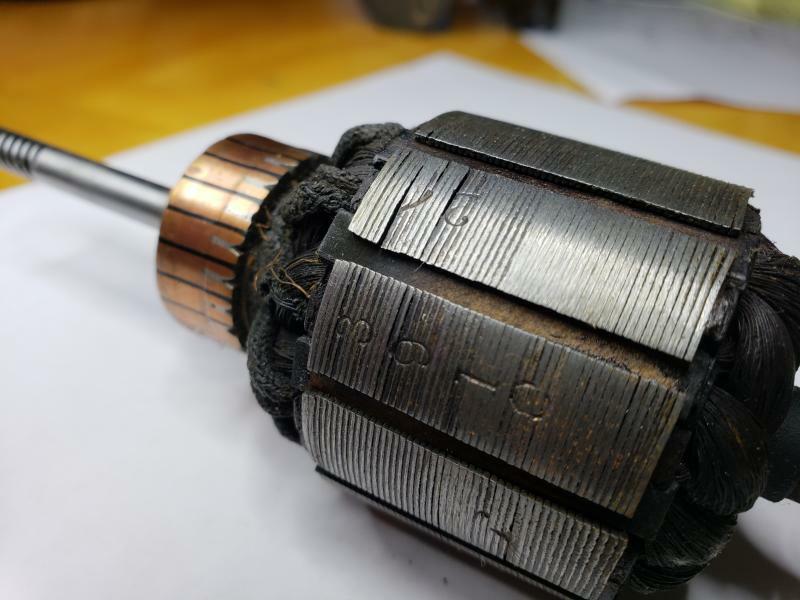 Even if they were the same type construction, the difference in stator size would probably rule out a swap. I forget if they’re truly 10” fans or maybe 9” or 9.5. But the blade versions are of the small variety. Rick: The paint that you see on my 3854 is the original black enamel which is very hard to match. There are several camps on this forum; those that feel you should just leave the fan as found; those that think you should clean up the paint, as is, with some FLITZ (google it- pretty good paint restorer stuff that is inexpensive) and some Meguiars Auto polish after and finally, those that would prefer to strip the old paint and rust off and start fresh with some automotive black primer followed by some good acrylic enamel spray paint and a couple of clear coats of lacquer. There are also those that go a step further and have the knowledge and wherewithal to apply the original black jappaning that some fans came with (not necessarily this fan). 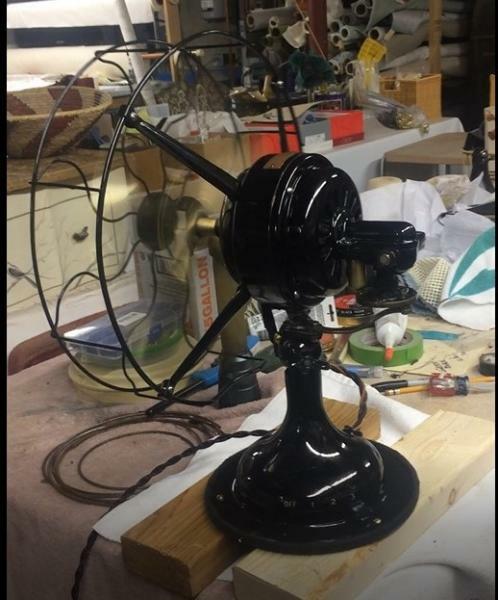 Then there are those that would powder coat the fan which gives an absolutely wonderful flawless result.The downside of powder coating is the expense and I heard that it is difficult or impossible to remove or buff out a scratch from a powder coated surface. I don't have any experience with powder coating but I did hear that it can be expensive. I prefer to save the original paint if there is enough of it in decent shape to preserve and just clean it up. In the event that the fan has a lot of rust and damage, I strip off the old paint, use two coats of spray automotive primer followed by two or three coats of good acrylic top coat quickly followed (before it dries hard) by two coats of clear lacquer. When completely dry, I use the Mequiars auto polish to finish the job. That gives a pretty good result though not as good as the original enamel. the R & M below has original black enamel on the front part of the case (with the original pin striping) and new paint on the rear which isn't a perfect match with the original black enamel but still not bad. Thanks for the info David and Lane. 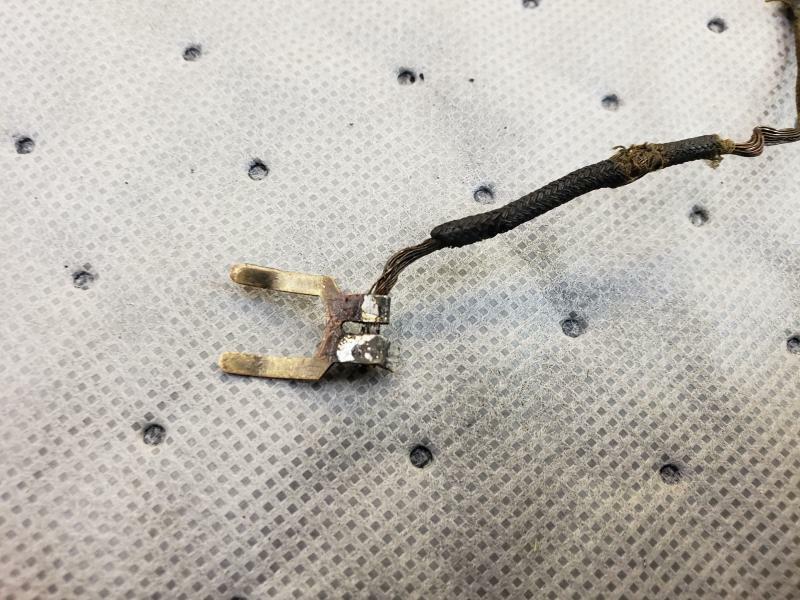 I may have found a switch/coil for this fan at Antique Fan Parts. They have one that they need to test first to see if its good. I'll most likely go with that if it works. 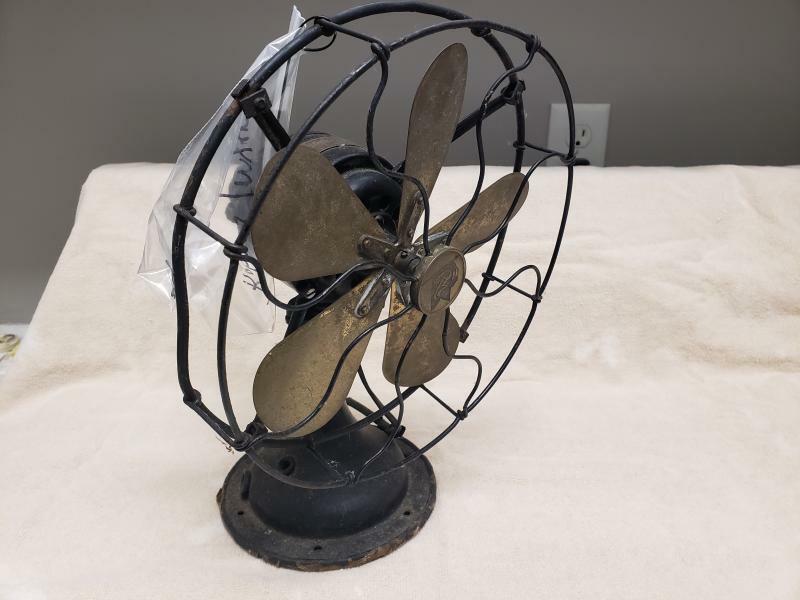 The rotor for this fan has some damage (see photos). The fan runs in this condition, however, should I be looking for a replacement, or leave well enough alone? 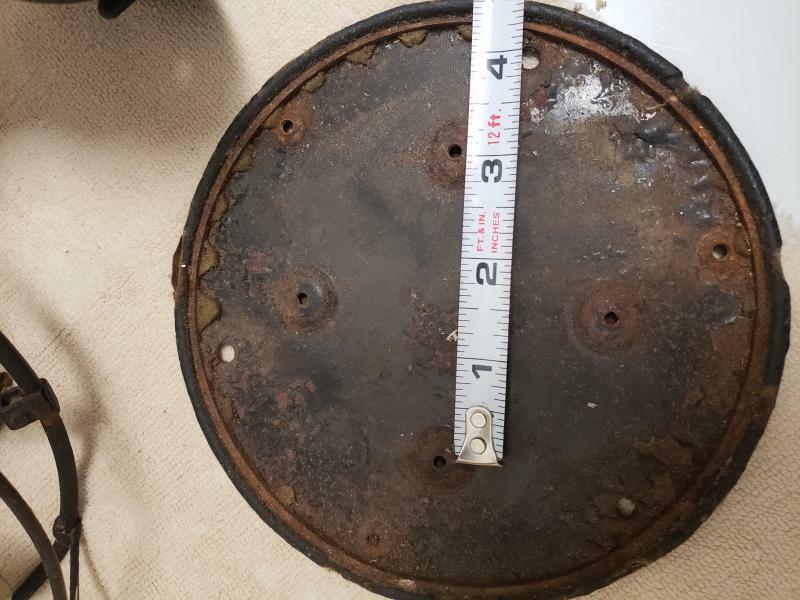 If replacing, how are these sized/identified? Are there interchangeable rotors? The brush caps are obviously different on this fan (see photos). Which were the correct caps, plastic or brass? Are they readily available? Thanks in advance for your replies and advice. This is a great online community! Regarding the brush caps, the bottom cap in your photo is the original, while the brass thing on top is the insert that goes into the plastic/phenolic/whatever cap shown at the bottom of your photo. You're missing the plastic part is all. I bet Chad Baker (antiquefanparts) has that missing plastic top for the brush for you Rick. Rotor looks fine to me. If it runs fine, then it is fine. Just my two cents. Rick Porter wrote: Thanks for the info David and Lane. 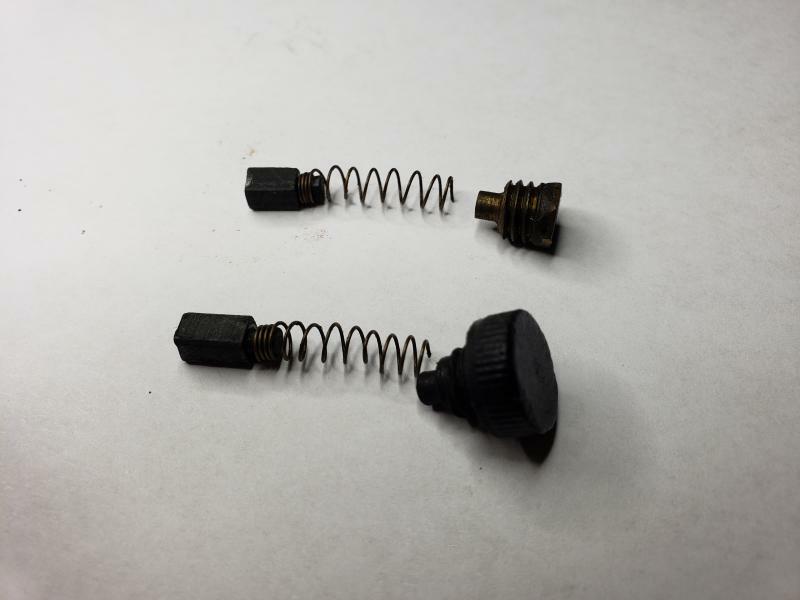 It is common for the bakelite/plastic insulator to break off of the brush cap. Look closely at the bottom one in your photo and you can see that the brass screw is the same. Darryl Hudson makes replacement brush caps. Don't throw your brass brush cap screw out if you replace it, many of us repair them. 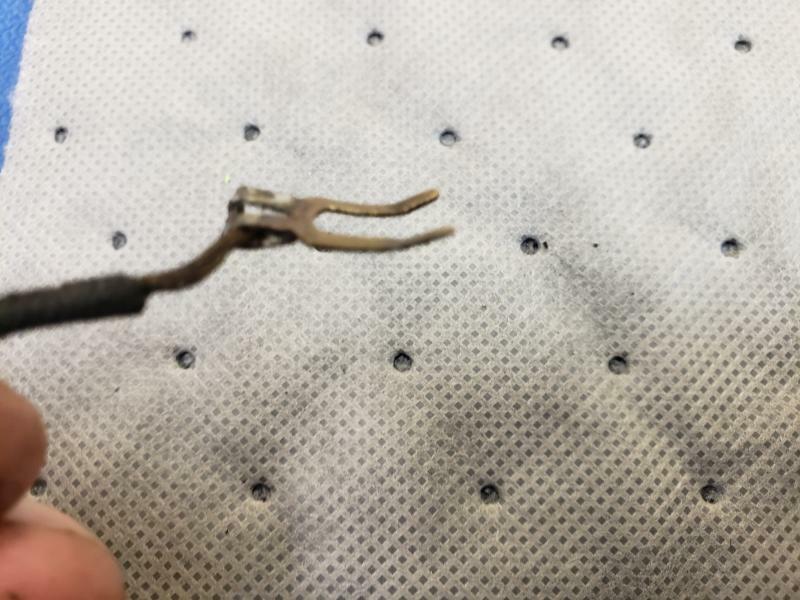 You might want to try repairing yours.The details can be found using the search button for "brush cap"
It looks like a few wires are broken on your armature (is this what you are referring to?) If so then yes, there is a problem. 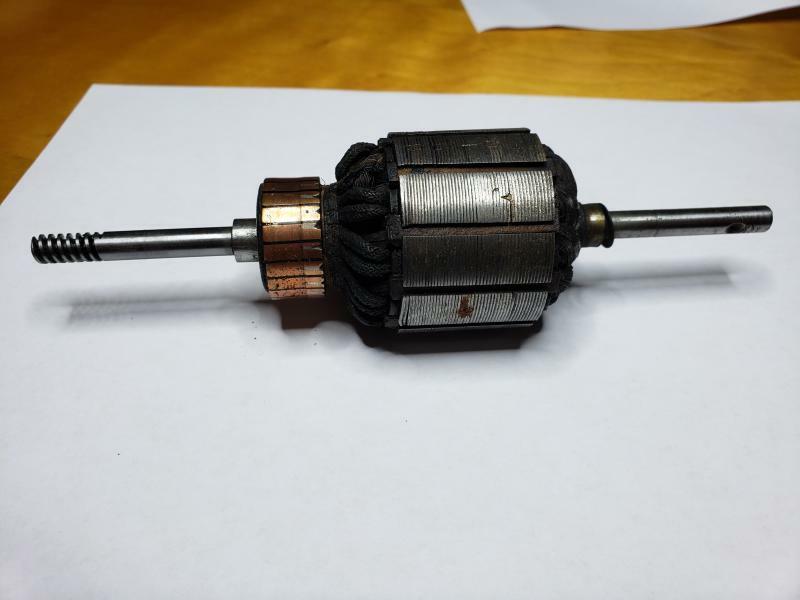 It might be that a few of the commutator segments are open. This will cause the fan to not start if the brushes are on these segments and it may also run poorly. You can use the search button for "armature testing" or "commutator testing" to see if there is in fact a problem. Are replacement armatures readily available, or would it be easier to have this one rewound? And if so, what kind of cost might I expect? 1)Are replacement armatures readily available? The short answer is no. You need one from a 2610. 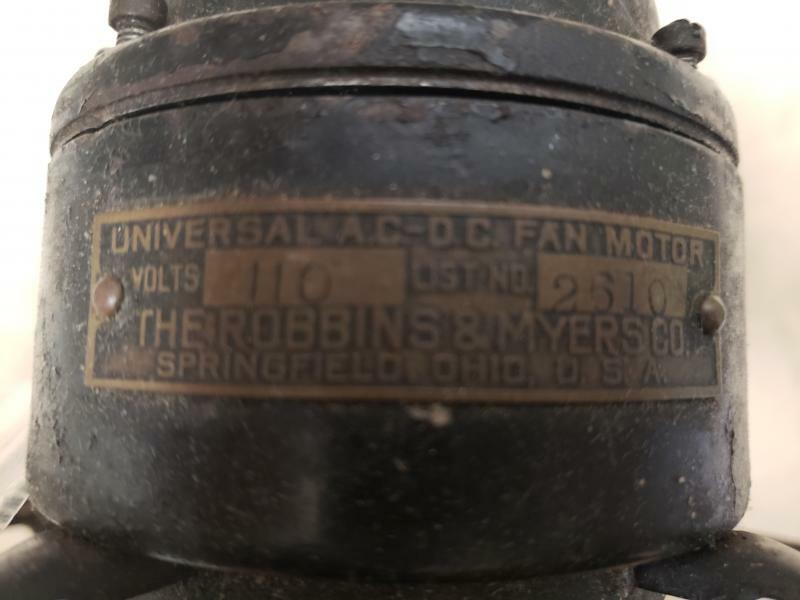 Maybe Chad has one (antiquefanparts.com)An armature from another R&M 10" oscillator might work. A switch from an R&M 10" fan may be the same or similar as well. 2)Would it be easier to have this one rewound? How much is this fan worth to you? If it was mine, I would put it together and run/display it while waiting for a parts fan. Dennis - I found most everything I need to get that old fan up and running. 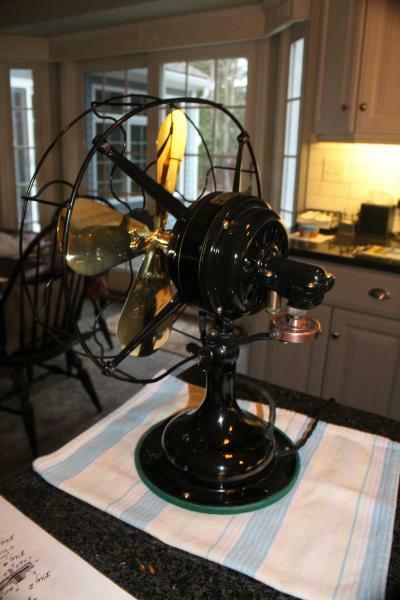 I have to give a big shout out to Linda at Antique Fan Parts. She's been very helpful. And also a big shout out to the folks responding to this thread with their advice and comments. This is a great community. If I may, I would like to throw another question regarding the terminal pictured. These are on two wires from the stator to the brush housings. What is the proper name? I've searched for Brush Terminal, Brush Spade Terminal, Stator Terminal, Stator to Brush Terminal, etc.. with no luck. 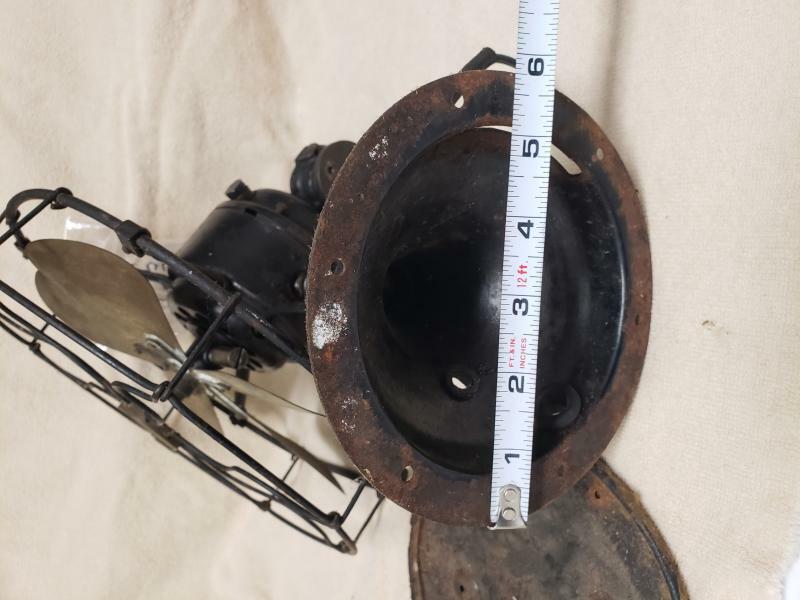 These are larger than a normal spade terminal, as it clips on to the brush housing (notice the turned-up tips) and looks to be made of brass. I can probably reuse the old ones, but it's soldered on pretty good and the tabs may break if I try and bend them up. Are these available to buy online that anyone knows of? Page processed in 0.1966 seconds (17% database + 83% PHP). 28 queries executed.